The Snack Girl Diet is a common-sense guide to weight loss and healthy eating written by popular blogger Lisa Cain. When Cain gained weight after having two children she tried many different diets but to no avail. She didn’t want to go on an extreme diet so she decided to simply pay more attention to what she was eating. Cain, who is also known as “Snack Girl”, became famous for her satisfying low-calorie snacks. 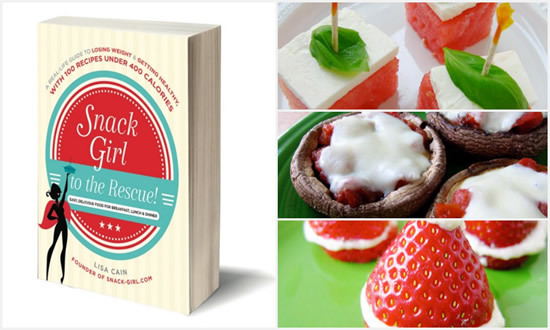 She aims to provide readers with encouragement, inspiration, recipes and practical advice about how to eat for lasting weight loss, which is found in her book Snack Girl to the Rescue. Eating for lasting weight loss. Making your favorite foods healthier. Trying new vegetables and whole grains. Her goal is to share the secrets and recipes that she uses to stay fit and healthy. She offers commonsense advice along with ideas for fun, quick and affordable meals and snacks. Snack Girl Diet has a variety of easy options to help her readers dodge junk food temptations. The key to a healthy snack is to keep the calories to 100-200 per portion and pack in as much nutrition as you can. Snack Girl to the Rescue includes two kinds of snacks. If you are trying to lose weight and you want to drink alcohol you have to realize that alcohol has a lot of empty calories. Sugary cocktails can be extremely high in calories. Have salad dressing on the side. No bread on the table. Choose grilled rather than deep-fried foods. Ask for salad instead of fries. Ezekial bread, high-fiber cereal, oatmeal, brown rice, natural peanut butter, almonds, eggs, cheese, yogurt, chicken breast, lean beef, ham, black beans, garbanzos, apples, banana, berries, avocado, broccoli, cauliflower, kale, sweet potato, mushrooms, mayonnaise, mustard, canola oil, dark chocolate. The Snack Girl Diet says that to start losing weight you should get yourself moving but set achievable goals. Begin doing just 5 minutes a day and develop a routine from there. Try to find fun ways to incorporate movement into your daily life. Above all don’t use food as a reward for exercise. Instead you can provide yourself with an incentive such as fresh flowers or lingerie. Snack Girl to the Rescue! : A Real-Life Guide to Losing Weight and Getting Healthy with 100 Recipes Under 400 Calories retails at $17.99. Offers a simple and commonsense approach to losing weight. Teaches you how to read nutrition labels. Snack Girl Diet provides options for quick, easy and healthful snacks. Includes 100 Weight Watchers-friendly recipes with nutritional information. The information may seem too basic for experienced dieters. Vegan snack and recipe options are limited. Snack Girl to the Rescue offers commonsense advice on how to lose weight without the need to follow a strict diet. The foundation of The Snack Girl Diet is its collection of ideas and recipes for simple snacks and meals between 100-200 calories.